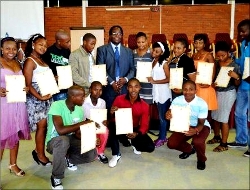 Once again MUT honours its students who excelled in the last examinations. Addressing students at the Deans Commendation ceremony on Tuesday, Prof. Marcus Ramogale, DVC Academic appealed to students to have self-confidence and look within themselves to find excellence and success. He further stated that Deans Commendation is a gesture by the University to recognise and present role models to other students. Excellence even comes in doubles at MUT. The Blose twins Sinothile and Sinegugu, 20, from KwaNyuswa in Port Shepstone, were among the recipients of this prestigious award. Speaking for both of them, Sinothile said: “We worked very hard the whole of last year, the Deans’ Commendation award has always been our focus. We feel very honoured to get these certificates.” Now they are doing their third year in ICT. Bongumusa Thungo, a BTech HR student looks back at his formative years at MUT with great pride. He says he is very happy with achieving the Deans’ Commendation award. The interesting fact was that there were familiar faces, meaning the good performance of the previous year was not a fluke.